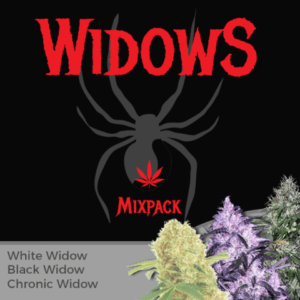 With three variations of ‘Widow’ hybrid marijuana strains, our Widows mixpack offers the very best quality seeds, capable of producing extremely potent plants, sparkling dense buds and weighty yields. If you want quantity and quality combined, but lack experience, these three easy-growing strains are the perfect choice for both indoor and outdoor growers alike. Extremely popular with medical growers for their powerful, natural pain-reliving properties, they are easy to grow and can adapt to either indoor or outdoor cultivation methods. The seeds are completely feminized, guaranteeing only female plants are created, with each one individually selected for quality, and assured to germinate. The perfect mix pack for all levels of experience. White Widow – One of the first true indoor marijuana plants and still as powerful and potent as ever. Black Widow -A potent and easy growing ‘White Widow’ variety with darker buds and up to 25% THC content. Chronic Widow – High THC and CBD levels, and a creamy, spicy flavor make it a popular choice for both indoor and outdoor growers. Sparkling dense buds and weighty yields.